Esther Nguyen - Entrepreneurs Must "Almost Die"
Entrepreneurs bring ideas into reality. The exciting part of being an entrepreneur is taking an idea and building it into something great. Persevere. Everyone who starts a business will “almost die” a few times. The key is to keep going no matter what. Don’t worry about this beforehand — the strength will come when you need it most. Show your appreciation to Esther on Twitter! founder and CEO of Pops. Esther: Hi, Chris. Good to be here. Chris: Hi Esther. How are you? Chris: Good. Esther, maybe we can begin by you telling us a little bit about Pops and its business. music, not only here in Vietnam, but also worldwide. content onto phones as ringtones and also iTunes? distribution channels, like iTunes and Amazon. Chris: Are we going to see Vpop in America? find a large library of games on iTunes. carriers and iTunes to then move into the gaming space? Esther: You can do a search, or you can go to our website at Pops.vn. things better, your life better. be and the positives, and that was more suitable for you? business around it. That’s the exciting part. Chris: Okay. Wow. Sounds like you chose the right career for you. Chris: Good. Esther, how did it feel to start your own business? what’s the flip side of that? What’s the reward? you feel great, just washes it all away? you have to die a few times. Esther: Not die, almost die. Chris: Did you almost die? found another way. So here we are. Chris: Would you agree with that statement now? Esther: Yes. Entrepreneurship. Yeah, absolutely. through that almost dying experience maybe more than once? going to regret it later on. Chris: And the strength will come at that moment? Esther: Yeah. 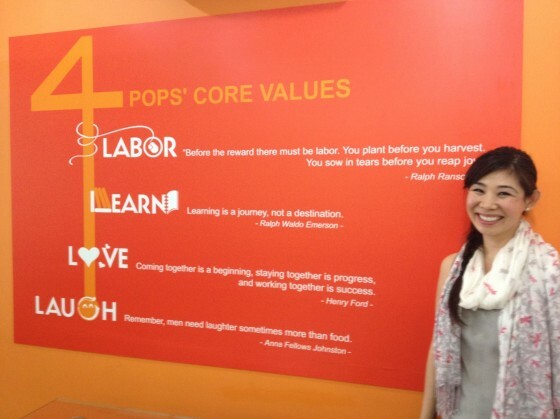 These four core values are the basic foundation of Pops. to keep up, and that entails learning. the times of failure or hard times, you have to laugh about it. would you have for them? through it all and just do it. Chris: So keep going, don’t stop. Chris: Great. Esther, thank you for joining me today.